One of the many things we look forward to each summer is going camping. We try to go at least twice per year, packing up the car with our tent, folding chairs, small propane grill, cooler, s’mores supplies, and all the other necessities. Then we’re off to Wisconsin, leaving the noise of the city behind for some peace and quiet. The weather has always cooperated over the years, but sooner or later, it had to catch up with us. We were supposed to head out for a long Labor Day camping trip with a few friends last Friday, but the weather forecast looked dark and stormy. Evan and I decided to postpone leaving until Saturday morning. We had a wonderful day and a half sitting around the fire, enjoying the nature surrounding us. A peek at the radar Sunday evening revealed a very large storm headed in our direction. We packed up everything in the dark, made one last dinner over the fire, and drove home late that night. While we didn’t get the full three days of camping in, we did enjoy the time we had. Even though our trip didn’t go as planned, we were excited to get an unexpected dinner invitation Friday night. 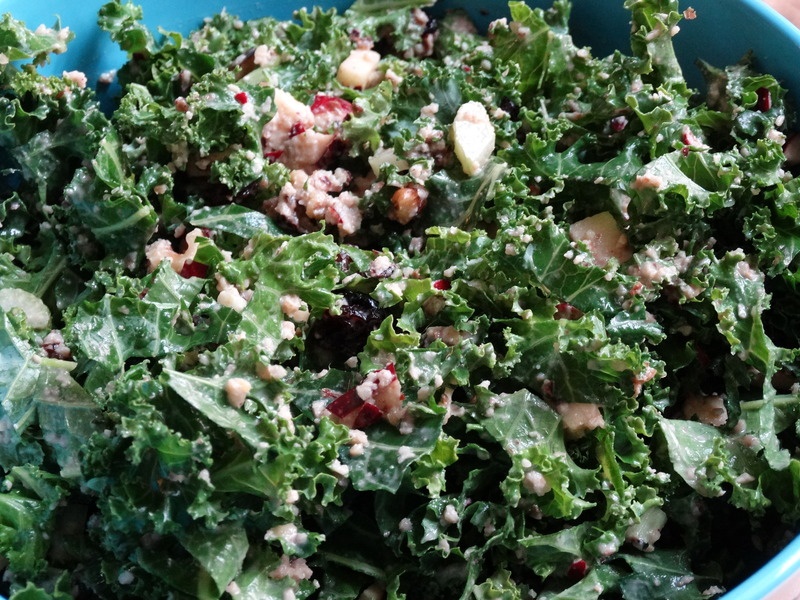 I whipped up this yummy salad to take with us! It is a healthy take on the traditional Waldorf salad, using a dressing made from apple, walnuts, mustard, and vinegar instead of mayonnaise. Begin by washing your kale. 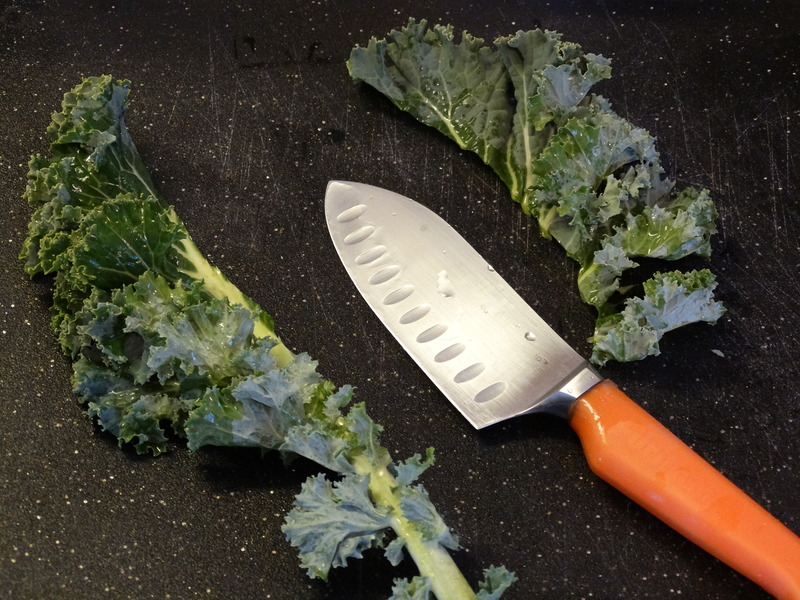 Use a knife to trim the leafy part of the kale off of the stem. Thinly slice 4 cups of the leaves and transfer them to a large serving bowl. 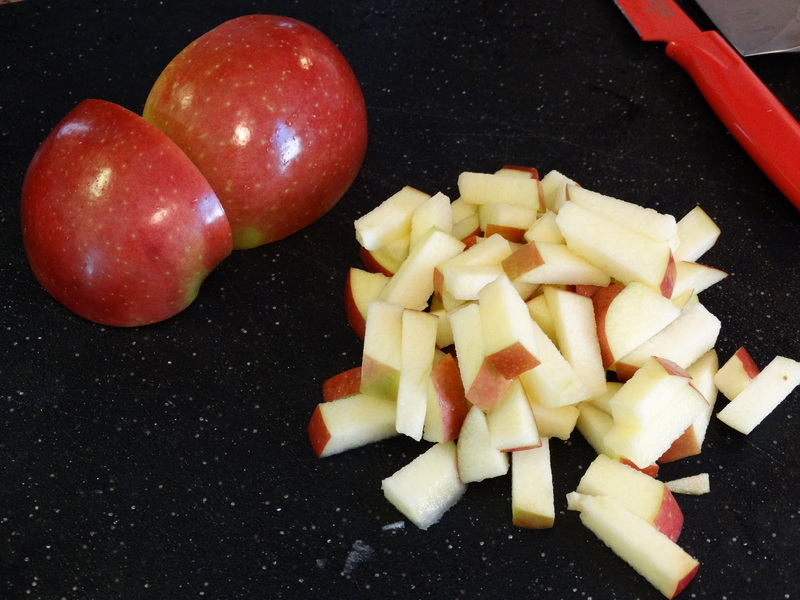 Chop one large red apple and 1/2 cup toasted walnuts. 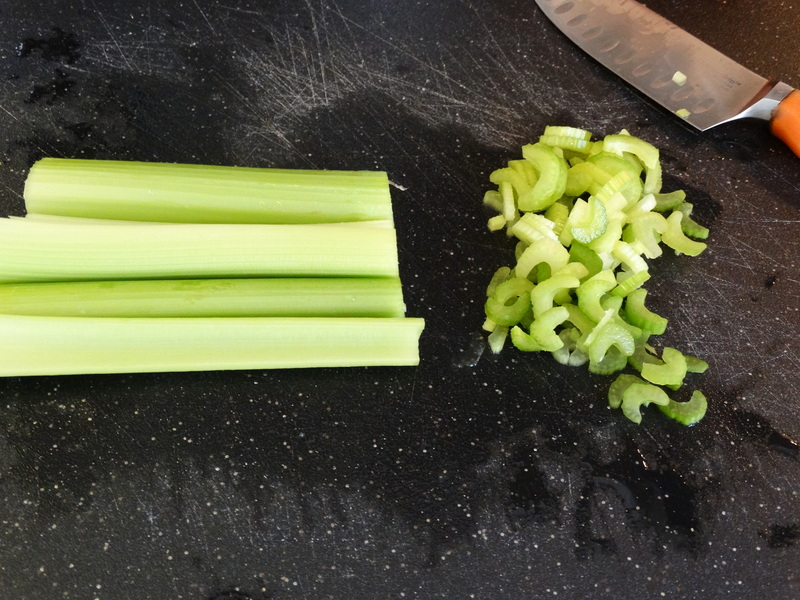 Thinly slice 1 cup celery. 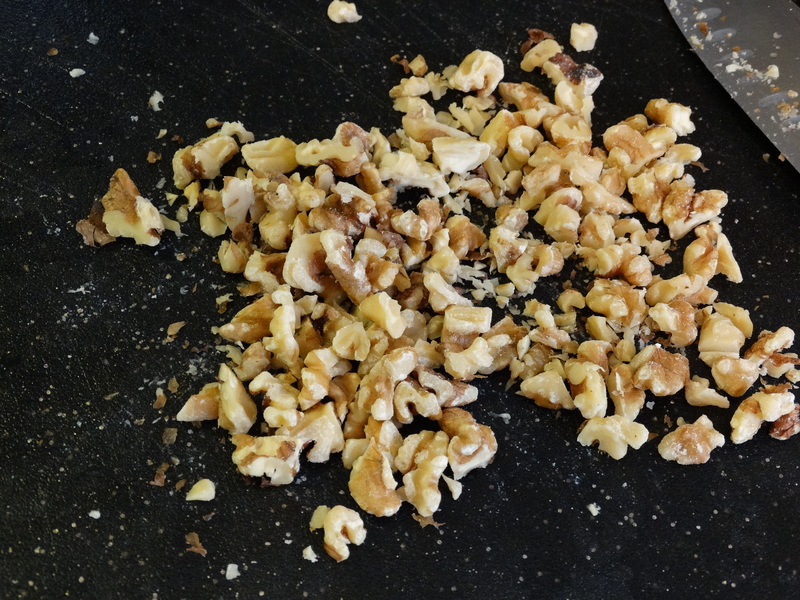 Add the celery, half of the chopped apple, 1/4 cup of the chopped walnuts, and 1/4 cup raisins to your bowl. In a small food processor or blender, add the remaining apple, walnuts, 2 tablespoons raisins, 2 tablespoons Dijon mustard, 2 tablespoons water, 1 tablespoon red wine vinegar, and 1/8 teaspoon sea salt. Purée until well combined. The mixture should be slightly thick. If it is too thick, you can add a bit more water. 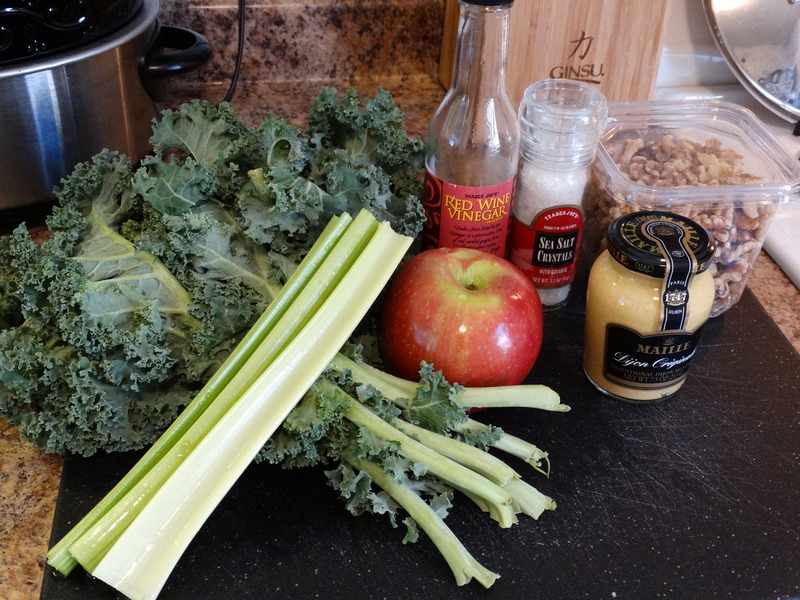 Pour the dressing over the kale salad, toss to combine, and it’s ready to serve! Enjoy! 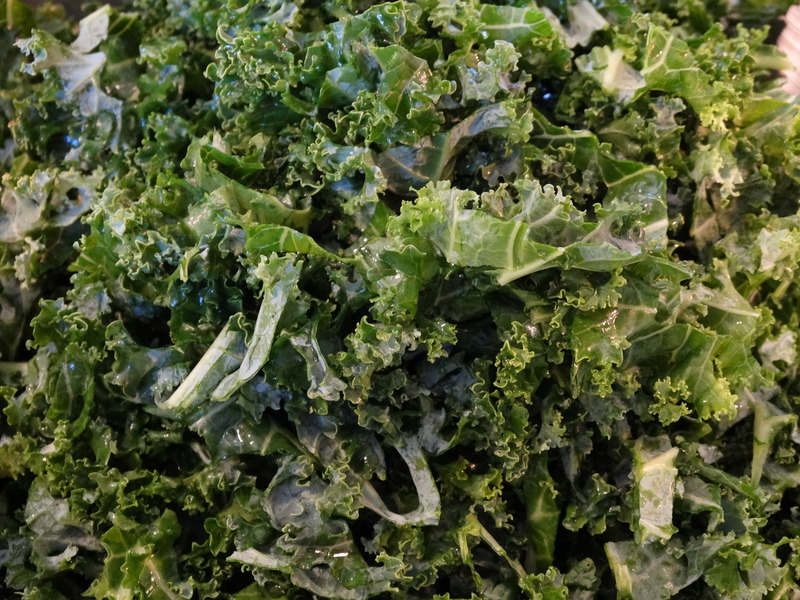 1) Add 4 cups thinly sliced kale to a large serving bowl. 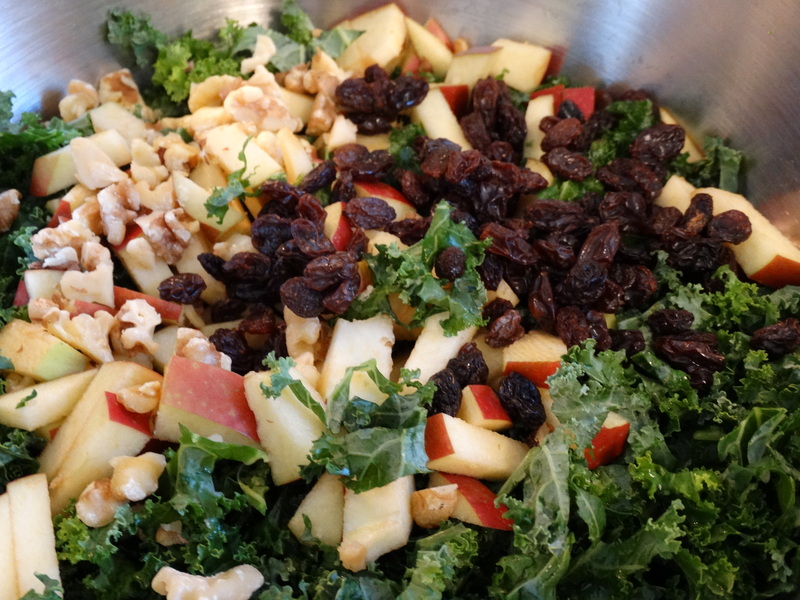 Top with half a chopped red apple, 1 cup thinly sliced celery, 1/4 cup chopped walnuts, and 1/4 cup raisins. 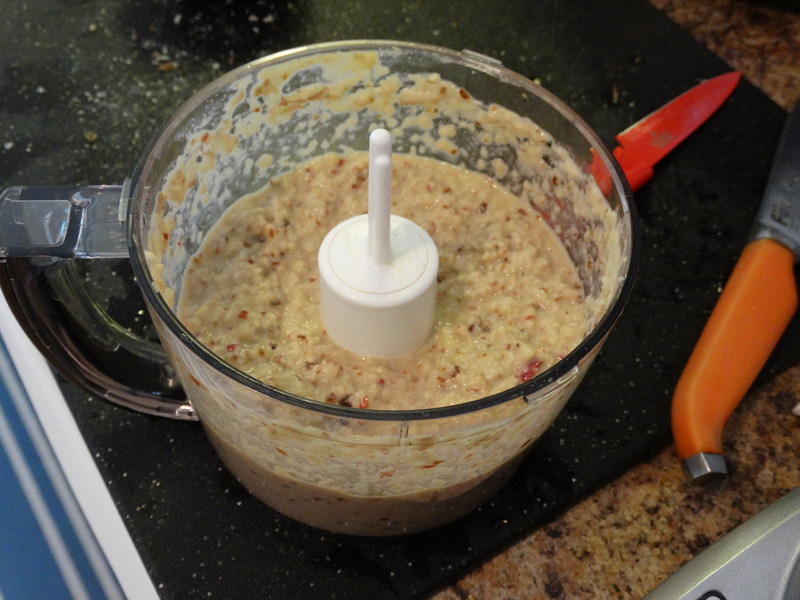 2) In a small food processor or blender, add the remaining apple, 1/4 cup walnuts, 2 tablespoons raisins, 2 tablespoons Dijon mustard, 2 tablespoons water, 1 tablespoon red wine vinegar, and 1/8 teaspoon sea salt. Purée until well combined. If the dressing is too thick, add a bit more water. 3) Toss to combine and serve. The dressing on this salad is my favorite part! We are growing kale in hanging baskets this year, and they are pretty much taking over our deck. Love finding new ways to use it! I’m so jealous! Living in the city, we don’t have any outdoor space to grow fruits or veggies. Enjoy your harvest!